If you think it’s easy to spot an Asian hornet nest, think again! 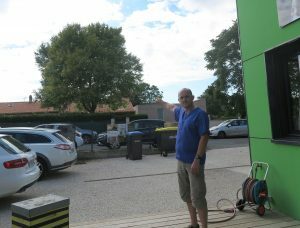 At Apinov (Vita’s partner in France) in La Rochelle, Dr Benjamin Poirot has a wealth of experience in dealing with Asian hornets, so you might expect that a nearby nest would give obvious visual clues. Not so! An Asian hornet nest very near his office went undetected until the leaves fell in autumn. How can the hornets keep their huge nests so secret? They give very few visual clues indicating the whereabouts of their home. You might expect Vespa velutina to fly straight back to its nest with it its prey. It doesn’t. It flies to a nearby perch — any direction — to behead up its catch. So, watching Vespa velutina after it has caught a snack won’t help much. You might expect to see a lot of traffic to and from the nest — there isn’t. However a new tagging system is emerging that may be able to track its whole flight path. And to catch Asian hornets predating your bees in late summer, there’s Apishield.